Folks had Sunny Side Oyster Bar in mind from 500 Things To Eat Before It Was Too Late, but it was apparently too late—they thwarted all our efforts to find a working phone number for them. (I must give credit to Chris Ayers for the "too late" quip.) So instead, we all went to 42nd Street Oyster House. This place is not at all an undiscovered gem - both parking lots serving it were full, and we had to park over a block away. Inside, the place was loud and pinkly lit. It was just as crowded inside; we were told that we'd have a two-hour wait for a table. Roz pulled out a twenty-dollar bill and approached the host. I dearly wanted to watch her negotiations, because my sheltered upbringing has left me unversed in such useful skills as bribery—but I thought that my gawking might diminish her effectiveness. She came back reporting that they wouldn't take her money, but she'd reduced the wait by an hour. Chris Ayers tutored me in the ways of eating raw oysters. One method involved putting the oyster on a saltine cracker with cocktail sauce and hot sauce; the other involved eating it out of the shell with cocktail sauce and strong horseradish. Both of these were much more pleasant than my first oyster experience, in which I ate the oysters raw and unadorned for lack of a guide like Chris—but a snarky part of my brain suggests that the reason these methods were so much more pleasant is that they dilute the oyster experience. 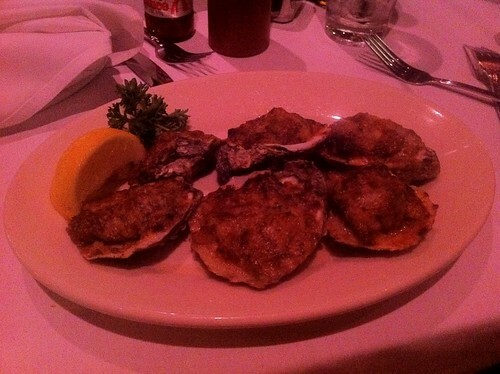 I ordered the Oysters Bienville, a combination of oysters with sherry, mushrooms, parmesan, shrimp, and bacon. Really, the only way this could be less kosher would be by including flying creeping things. 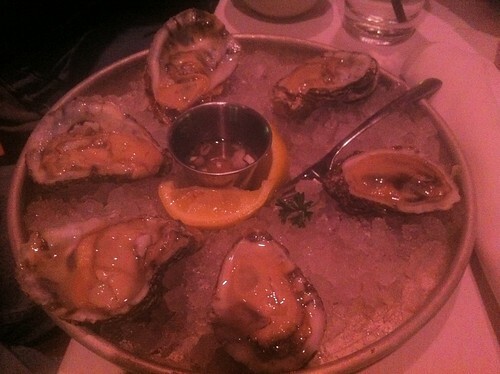 The predominant taste was mushroom and sherry, but there was a dark under-taste of oysters. I probably would not order this again. 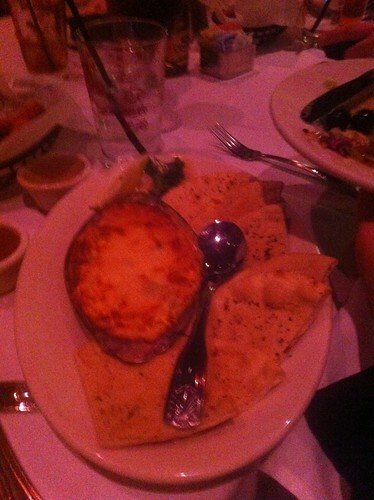 Lori ordered a crab and artichoke dip, but it was too jalapeno-hot for her to enjoy and too cheesy for me to enjoy.